The New York Giants have terminated the contract of wide receiver/returner Dwayne Harris, who was set to count $4.05 million against the 2018 salary cap. The move “saves” the Giants $2.45 million against the 2018 cap despite counting $1.6 million in dead money. Harris was placed on Injured Reserve in October 2017 after fracturing his foot in Week 5. The foot injury required surgery. Harris finished the year with no catches, nine kickoff returns (20.9 yards per return), and seven punt returns (6.9 yards per return). Harris was originally drafted in the 6th round of the 2011 NFL Draft by the Cowboys. The Giants signed him in free agency in March 2015 to a a 5-year, $17.5 million contract. In his initial season with the Giants, Harris caught a career-best 36 catches for 396 yards and four touchdowns. He also averaged 10 yards per punt return and 28.7 yards per kickoff return, becoming the first Giants player in 60 years to return a kickoff and punt for a touchdown in the same season. However, Harris suffered through an injury-plagued season in 2016, catching only one pass and seeing his punt (5.9 yards per return) and kickoff (24.2 yards per return) averages decline. Harris did remain a force on punt coverage and he was voted to his first Pro Bowl after the 2016 season. 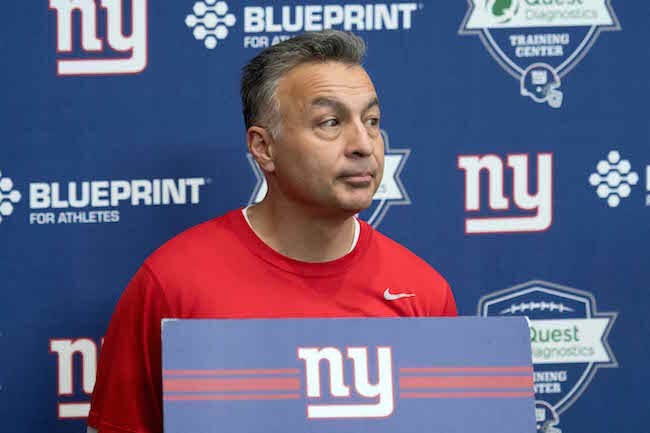 The football offseason is officially over on Thursday when New York Giants players report to summer training camp at Quest Diagnostics Training Center in East Rutherford, New Jersey. The first practice will be held at 11:40AM on Friday and will be one of eleven practices open to the public, weather permitting. The training camp schedule is available at Giants.com. Following up on our June 7 report that New York Giants wide receiver Roger Lewis was arrested in Ohio for operating a vehicle while impaired, that charge was dropped on Monday. Lewis was fined $150 plus court fees for driving in marked lanes and $25 for having tinted windows. Police originally said they found evidence of drug use in Lewis’ vehicle and suspected Lewis was under the influence of alcohol, but he refused to be tested on the scene. Unrestricted free agent running back Bobby Rainey (New York Giants) has signed with the Baltimore Ravens. The Giants had no interest in re-signing Rainey. The Giants signed Rainey as an unrestricted free agent from the Tampa Bay Buccaneers in April 2016. He played in 15 games with no starts and finished the season with 17 carries for 63 yards (3.7 yards per carry) and 20 catches for 153 yards (7.6 yards per catch). Rainey also returned six punts (6.5 yards per return) and eight kickoffs (25.5 yards per return). Rainey was originally signed as an undrafted rookie free agent by the Baltimore Ravens after the 2012 NFL Draft. He has spent time with the Ravens (2012), Cleveland Browns (2013), and Tampa Bay Buccaneers (2013-2015). 2016 YEAR IN REVIEW: The Giants place-kicking situation was upended midway through 2016 when super-steady Josh Brown – who had made over 91 percent of his field goal attempts since joining the Giants in 2013 – was unceremoniously cut due to significant off-the-field issues. The Giants replaced him with long-time Chicago Bear Robbie Gould who was a perfect 10-of-10 on field goal attempts in 10 regular-season games. Punter Brad Wing had a strong season in 2016, averaging 46.2 yards per punt (40.9 yard net). He had 28 kicks downed inside the 20-yard line. Wing was also named “NFC Special Teams Player of the Week” twice. 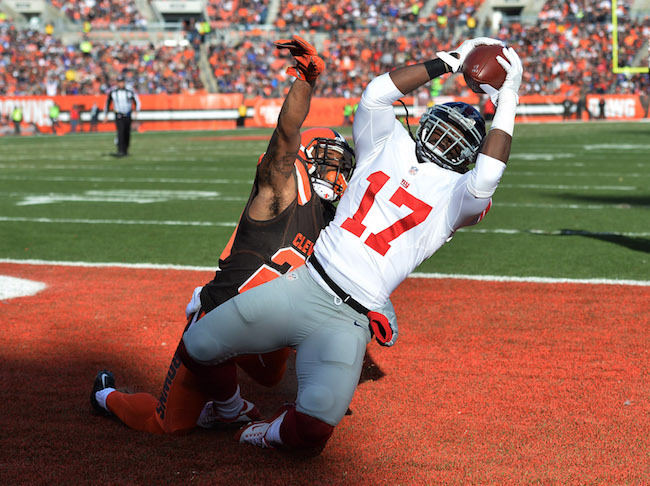 In his second year with the Giants, Dwayne Harris suffered through a frustrating, injury-plagued season. While he played in all 16 regular-season games, Harris was hampered by a variety of nagging injuries all season. His special teams return numbers plummeted with his punt return average falling from 10.0 yards to 5.9 yards and his kickoff return average falling from 28.7 yards to 24.2 yards. He also did not score a year after becoming the first Giants player in 60 years to return a kickoff and punt for a touchdown in the same season in 2015. Harris did remain a force on punt coverage and he was voted to his first Pro Bowl. 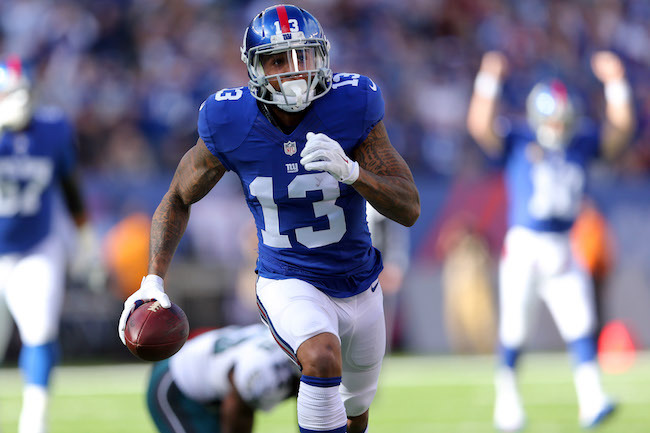 With Harris ailing, Bobby Rainey (six punt and eight kickoff returns) and Odell Beckham, Jr. (10 punt returns) shared return duties. Overall, the Giants finished 2016 7th in kickoff return average (23.8 yards per return) and 29th in punt return average (6.1 yards per return). On the flip side, the Giants were 23rd in covering kickoffs (22.8 yards per return) and 19th in covering punts (8.9 yards per return). 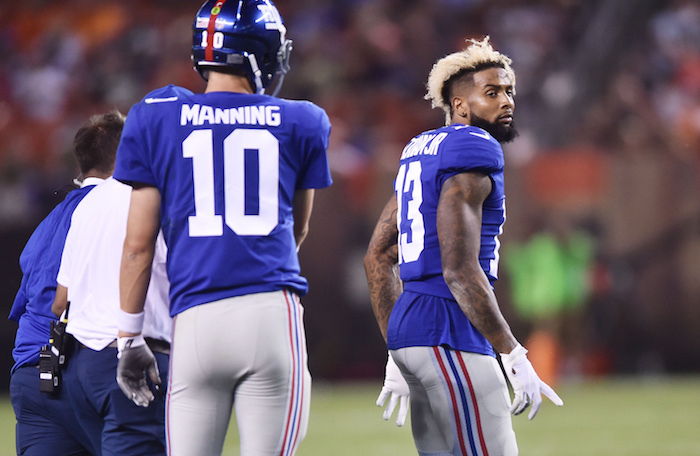 The Giants neither scored nor allowed touchdowns on returns, but the Giants did return a blocked field goal attempt for a touchdown. ADDITIONS/SUBTRACTIONS: Robbie Gould signed a 2-year contract with the San Francisco 49ers in March. 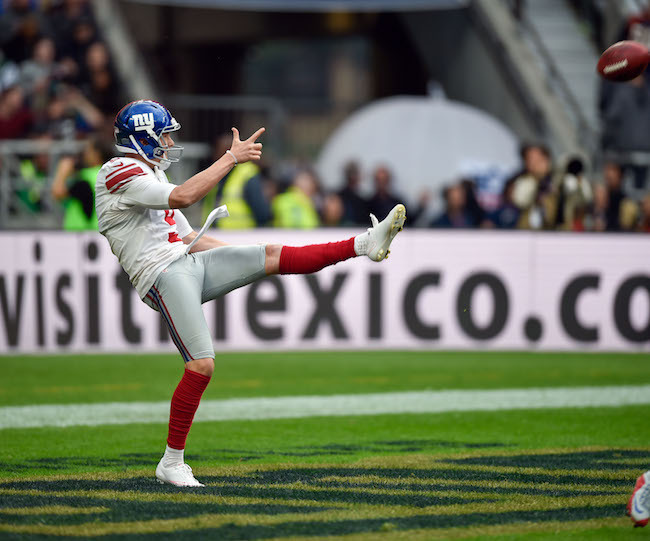 Place kicker Aldrick Rosas was signed by the Giants to a reserve/future contract in January 2017. Rosas was originally signed as an undrafted rookie free agent by the Tennessee Titans after the 2016 NFL Draft, but he did not make the team. 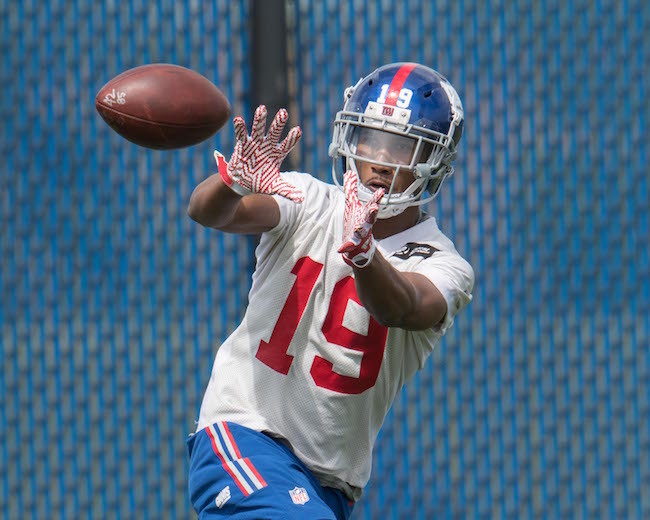 TRAINING CAMP STORY LINES: On special teams, the story clearly is the unknown and unproven 22-year old Aldrick Rosas. Currently, Rosas is facing no competition for the job. Games and seasons often come down to field goal kicks. Indeed, Rosas may be THE most important player to follow in the preseason. A secondary story line is whether or not Dwayne Harris can rebound from a disappointing and injury-plagued 2016 season. Harris is due to make $2.475 million salary in 2017 and $3.225 million in 2018 and 2019. He needs to justify those high salary figures. ON THE BUBBLE: Even though he is currently facing no veteran competition, clearly Aldrick Rosas is on the hot seat. A discarded veteran kicker could be added at any time. PREDICTIONS: It’s impossible to make an informed prediction on Aldrick Rosas because he is such an unknown commodity. He has the tools and the Giants obviously like what they have seen in the spring from him. But you cannot replicate real-game pressure. It is those pressure kicks and consistency that define a place kicker. If he falters in the preseason, look for the Giants to quickly add a veteran to the mix. FINAL DEPTH CHART: Brad Wing and Dwayne Harris are givens. Right now, it is Aldrick Rosas’ job to lose. The New York Giants have officially announced that the team has re-signed unrestricted free agent linebacker Keenan Robinson. The Daily News is reporting that the contract is a 1-year, $4 million deal. Robinson received interested from the Cincinnati Bengals and Buffalo Bills in free agency. Robinson officially only started 6-of-16 regular-season games for the Giants in 2016, but he was second in playing time on the team among all linebackers (71 percent of all defensive snaps). Robinson finished 2016 with 83 tackles and seven pass defenses. Robinson has decent size and is a good athlete who runs well. Versatile, he can play inside and outside linebacker. Robinson is more of a run-and-hit linebacker than stout run defender at the point-of-attack. Robinson is solid in pass coverage. He only has 1.5 career sacks and has been injury prone. Robinson does not make many impact plays. 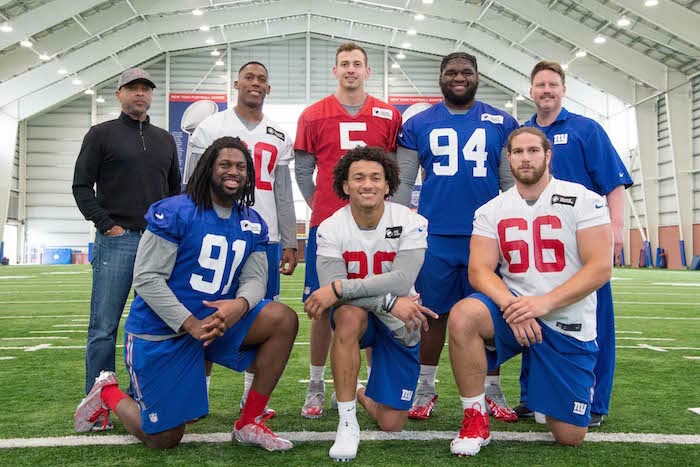 Video of an exclusive Giants Insider interview is available at Giants.com. According to NFL Player Association records, New York Giants wide receiver/special teams ace Dwayne Harris has accepted a $500,000 pay cut to his 2017 salary. Harris’ salary was reduced from $2,975,000 to $2,475,000. His overall 2017 cap number was $3.8 million and is now $3.3 million. According to ESPN, $1.1 million of Harris’ contract in 2017 is now fully guaranteed. ESPN says Harris can earn back the $500,000 plus an addition $100,000 in incentives if he averages 10.0 yards per punt return. In his second year with the Giants, Dwayne Harris suffered through a frustrating, injury-plagued season. While he played in all 16 regular-season games with one start, Harris was hampered by a variety of nagging injuries all season. A year after his career-best 36 catches for 396 yards and four touchdowns, Harris caught only one pass for 13 yards and a touchdown. More importantly, his special teams return numbers plummeted with his punt return average falling from 10.0 yards to 5.9 yards and his kickoff return average falling from 28.7 yards to 24.2 yards. He also did not score a year after becoming the first Giants player in 60 years to return a kickoff and punt for a touchdown in the same season. Harris did remain a force on punt coverage and he was voted to his first Pro Bowl. Harris was originally drafted in the 6th round of the 2011 NFL Draft by the Cowboys. The Giants signed him in free agency in March 2015. Though he lacks height, Harris is a well-built athlete with decent speed and quickness. He is tough and physical and an asset as a blocker in the running game. Harris can play in the slot and has decent hands. Harris has four career returns four touchdowns and has won the “NFC Special Teams Player of the Week” award four times in his career. Quarterback Ryan Nassib, who is an unrestricted free agent who is not expected to be re-signed, had worn #12. 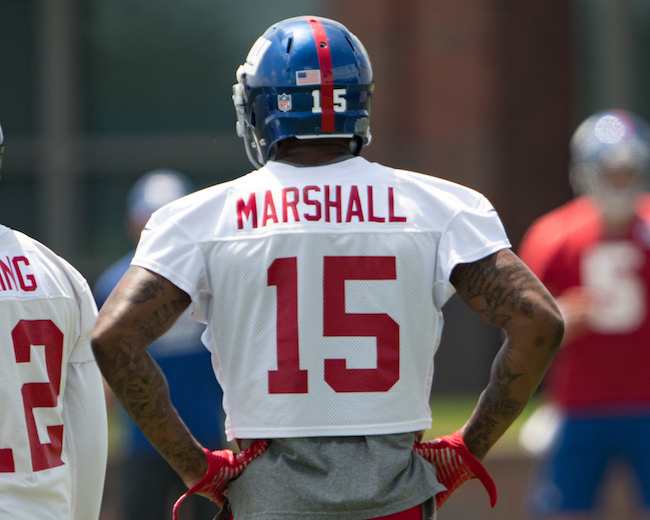 According to multiple press reports, the New York Giants have agreed to terms with wide receiver Brandon Marshall. The contract is reportedly a 2-year, $12 million deal. 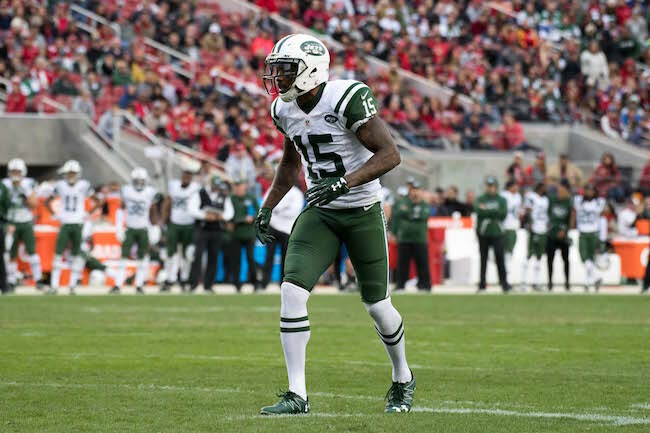 Marshall, who turns 33 this month, was released by the New York Jets last week. Marshall was originally drafted in the 4th round of the 2006 NFL Draft by the Denver Broncos. He has played with the Broncos (2006-2009), Miami Dolphins (2010-2011), Chicago Bears (2012-2014), and Jets (2015-2016). Marshall is a six-time Pro Bowler (2008, 2009, 2011, 2012, 2013, and 2015) and two-time All-Pro (2012 and 2015). Marshall is the only player in NFL history with six seasons of 100 or more receptions. In 2016, started 15 regular-season games despite battling knee and foot injuries that he suffered in Week 2. Marshall caught 59 passes for 788 yards and three touchdowns. Those numbers were dramatically down from his 109-catch, 1,502-yard, 14-touchdown 2015 season. While Marshall is nearing the end of a stellar career, he still is a huge (6’4”, 230 pounds), physical play-maker who runs well after the catch and is tough to tackle. Lacking classic speed and quickness, Marshall is more possession receiver than deep threat. Good run blocker. I'm told the Giants did shop the high end of the WR market (DeSean, Pryor), but those players were out of their price range. 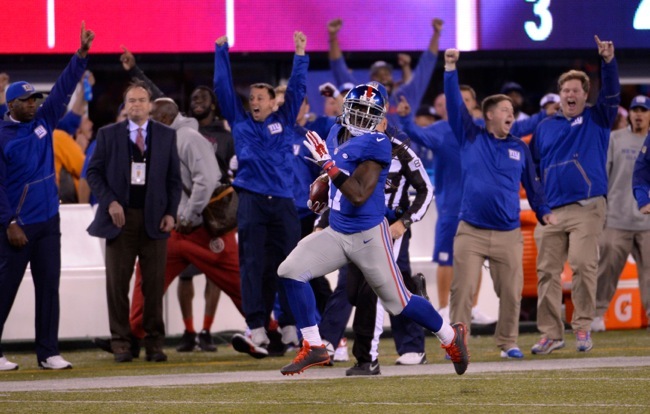 ESPN is reporting that the New York Giants are seeking to restructure wide receiver/returner Dwayne Harris’ contract. If an agreement is not reached, the team may cut Harris. Harris has three years left on his current 5-year contract. His 2017 cap figure is $3.8 million, including $2.975 million in salary. Harris was originally drafted in the 6th round of the 2011 NFL Draft by the Cowboys. The Giants signed him in free agency in March 2015. In his second year with the Giants, Harris suffered through a frustrating, injury-plagued season. While he played in all 16 regular-season games with one start, Harris was hampered by a variety of nagging injuries all season. A year after his career-best 36 catches for 396 yards and four touchdowns, Harris caught only one pass for 13 yards and a touchdown. More importantly, his special teams return numbers plummeted with his punt return average falling from 10.0 yards to 5.9 yards and his kickoff return average falling from 28.7 yards to 24.2 yards. He also did not score a year after becoming the first Giants player in 60 years to return a kickoff and punt for a touchdown in the same season. Harris did remain a force on punt coverage and he was voted to his first Pro Bowl.